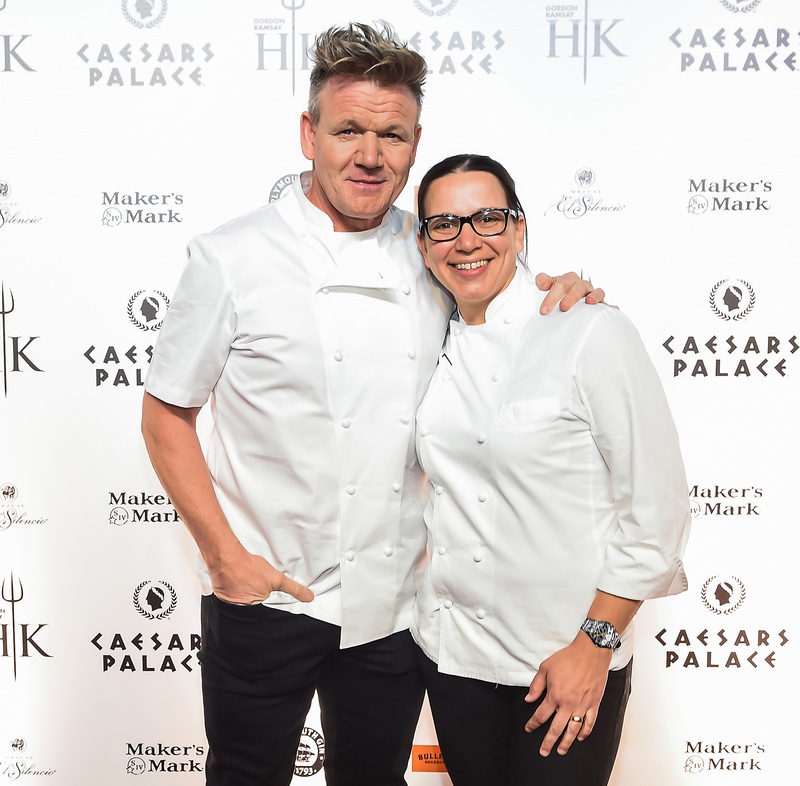 LAS VEGAS (Jan. 27, 2018) – Multi-Michelin star chef and television personality Gordon Ramsay, joined by the finalists of Season 17 HELL’S KITCHEN All-Stars and famous faces from the sports and entertainment world, celebrated the official grand opening of the first-ever Gordon Ramsay HELL’S KITCHEN restaurant at Caesars Palace in Las Vegas. Since its soft opening in early January, the highly-anticipated restaurant has already received reservations for nearly 25,000 guests. Reservations are available for lunch and dinner and can be made at www.GRHellsKitchenLV.com. 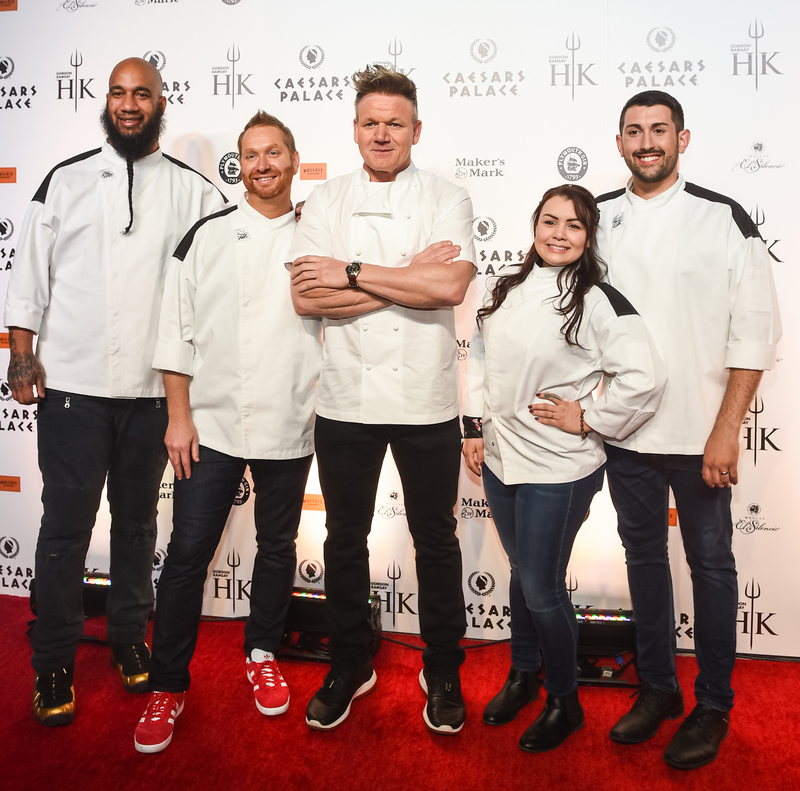 Designed to be an experiential and immersive destination restaurant, guests at Gordon Ramsay HELL’S KITCHEN will feel transported to the studio set of the globally popular FOX television show. 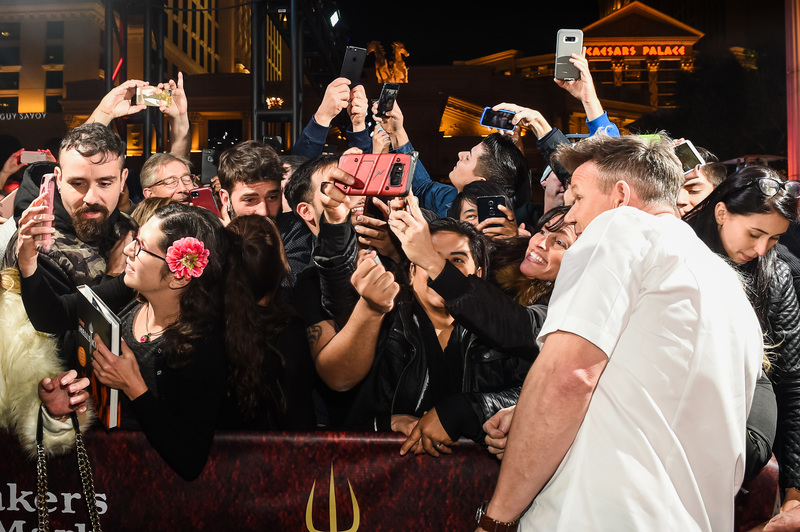 The inspiration from the hit show is evident from the signature fiery pitchfork – direct from the set of the popular TV show – that marks the entryway, to the life-size video screen of Chef Ramsay that greets guests upon arrival, to the chef uniforms and menu items. 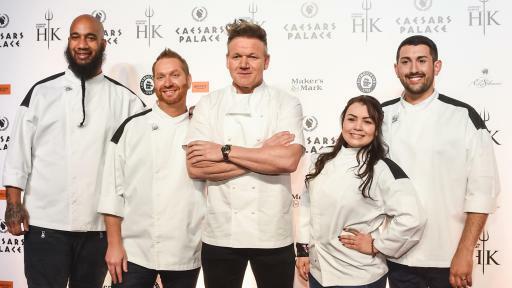 The winner of current Season 17 of HELL’S KITCHEN All-Stars will be named Head Chef and have portrait hung with the other previous champions on the winner’s wall. Masterfully designed by Jeffrey Beers International, the first-of-its-kind restaurant boasts design features that are engaging to all senses and are a nod to both the red and blue teams featured on the show. The dynamic and bustling kitchen is the centerpiece of this unique eatery, with mosaic tiles framing the open space artfully, allowing guests to appreciate from every seat in the house. 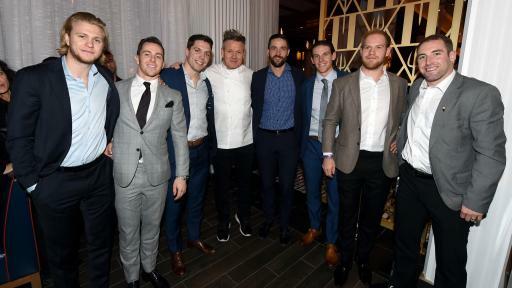 Chefs and cooks in the kitchen will be in the exact uniforms from the show – red and blue jackets with coordinating bandanas. To further bring the electric atmosphere of the studio into the dining room, additional key elements of the show are infused in the design, such as fire and heat and custom designed lighting that combine brass rods with pitchfork features and runs across the high ceilings. HELL’S KITCHEN’s iconic “H” and pitchfork symbols are cleverly featured throughout the custom-designed, laser-cut screen partitions and soft charcoal and ash-hued wallcovering. 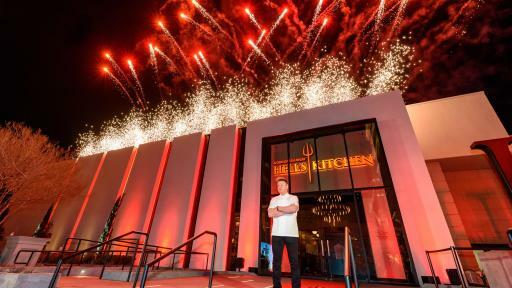 With floor-to-ceiling glass windows facing the famous Las Vegas Strip and Caesars Palace’s iconic fountains, Gordon Ramsay HELL’S KITCHEN seats nearly 300 guests and features indoor and Strip-adjacent dining. Currently offering lunch and dinner daily, the eatery also boasts a spirited bar menu. Several of the most successful signature menu items and recipes featured on the television show can now be experienced during lunch and dinner including Pan Seared Scallops, Lobster Risotto, Beef Wellington, Truffle Arancini, Brick Pressed Chicken and Crispy Skin Salmon. Special menu items direct from the show will be added as new episodes air. To perfectly complement the cuisine or to simply enjoy at the restaurant’s sprawling bar, the cocktails at HELL’S KITCHEN are not to be missed. The signature creations include the gin-based Notes from Gordon, garnished with a scroll printed with a surprise note from Gordon Ramsay; the citrus and rosemary laden Chef’s Stew, served bubbling and steaming from dry ice; and the rye-based Smoke on the Blvd, which arrives in a cherry-wood smoke-filled glass cabinet. The restaurant also boasts an expertly curated wine list with over 20 wines offered by the glass. The beer list is also notable with more than 30 options, and includes an exclusive HELL’S KITCHEN Special Brew IPA from Stone Brewing. 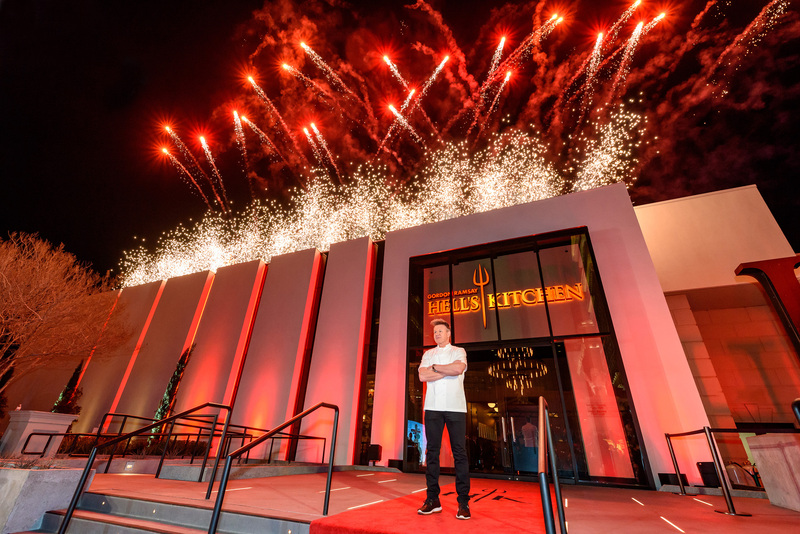 Gordon Ramsay HELL’S KITCHEN marks Ramsay’s fifth Las Vegas restaurant and extends his successful partnership with Caesars Entertainment to seven eateries with more to come. 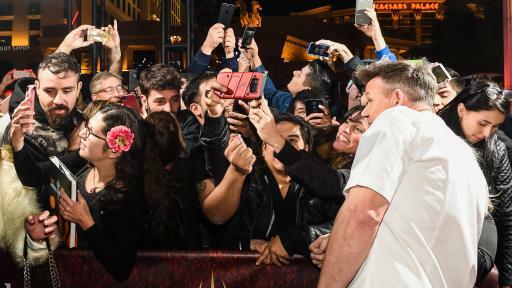 The new restaurant is a partnership between Gordon Ramsay and Caesars Entertainment in conjunction with ITV America. HELL’S KITCHEN airs in the U.S. on FOX and is produced by ITV Entertainment in association with A. Smith & Co. Productions. Arthur Smith, Kent Weed, Kenny Rosen, David Eilenberg and Gordon Ramsay serve as executive producers. HELL’S KITCHEN airs in 41 countries around the globe. 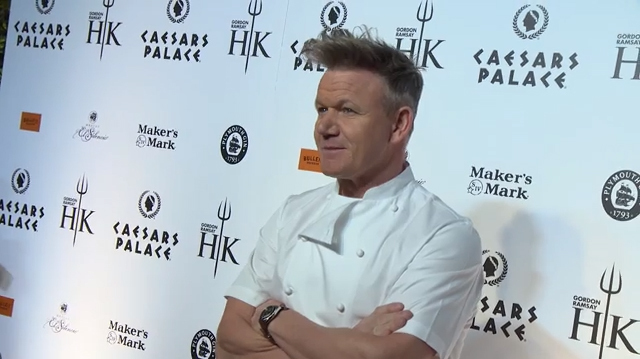 Renowned for highly successful and award-winning original programming, Emmy nominated, multi-Michelin star chef Gordon Ramsay produces TV shows on both sides of the Atlantic seen by audiences worldwide, including his FOX shows THE F WORD, 24 HOURS TO HELL & BACK, MASTERCHEF, MASTERCHEF JUNIOR, HELL’S KITCHEN and MASTERCHEF CELEBRITY SHOWDOWN, as well as Bravo’s “Best New Restaurant” and Food Network’s competition series “Food Court Wars.” In the U.K., he’s produced “Gordon Ramsay Behind Bars” and “Gordon Ramsay’s Great Escape” for Channel 4; food biography and nostalgia series “My Kitchen” for UKTV’s Good Food Channel; two instructional cookery series, “Ultimate Home Cooking” and “Ultimate Cookery Course” for Channel 4; and the first two seasons of “Matilda And The Ramsay Bunch,” all under his One Potato Two Potato banner. His next-generation multi-media production company STUDIO RAMSAY has a joint venture with All3Media to develop and produce both unscripted and scripted television shows, creating new formats and innovative programming that includes a scripted arm focused on food-related themes, and development of new talent on a global front. The catalogue of programs that Ramsay has worked on historically with All3Media via One Potato Two Potato, together with new original content he’s currently developing, make for a unique and dynamic production and distribution partnership. 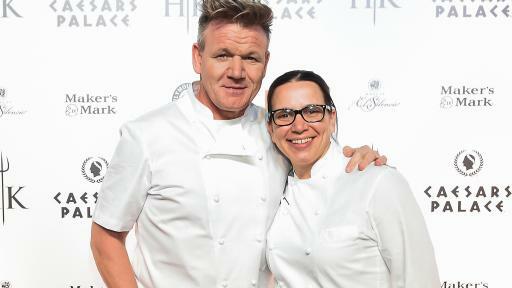 Studio Ramsay’s first production, THE F WORD WITH GORDON RAMSAY, premiered live this past summer in the U.S. on FOX. Its first daytime cooking series, CULINARY GENIUS, premiered in the spring on ITV in the U.K. was syndicated on FOX stations in the U.S. this summer while his new documentary series, GORDON ON COCAINE, for ITV premiered in the fall. Seasons 3 and 4 of “MATILDA AND THE RAMSAY BUNCH,” starring Tilly Ramsay for U.K. children’s channel CBBC are also produced by STUDIO RAMSAY. The Gordon Ramsay Group comprises the restaurant business of acclaimed chef, restaurateur, TV personality and author Gordon Ramsay. The Gordon Ramsay Group employs more than 700 people in London where it has a collection of 14 restaurants. They also have a total of 33 restaurants globally and 7 Michelin stars, with international restaurants spanning from Europe to the US, as well as the Middle East. For more information, please visit www.gordonramsay.com or follow Gordon Ramsay on Facebook, Twitter and Instagram. Fox Broadcasting Company (FOX), a unit of 21st Century Fox, is home to some of the highest-rated and most acclaimed series on television, including EMPIRE, THE MICK, LETHAL WEAPON, LUCIFER, GOTHAM, THE LAST MAN ON EARTH, NEW GIRL, BROOKLYN NINE-NINE, STAR, THE EXORCIST, THE SIMPSONS, FAMILY GUY, BOB’S BURGERS, HELL’S KITCHEN, MASTERCHEF, MASTERCHEF JUNIOR and SO YOU THINK YOU CAN DANCE; as well as new series THE GIFTED, THE ORVILLE, 9-1-1, LA TO VEGAS,GHOSTED, BEAT SHAZAM, LOVE CONNECTION and THE F WORD WITH GORDON RAMSAY; and upcoming drama THE RESIDENT. FOX airs 15 hours of primetime programming a week, as well as major sports and Sunday morning news. Through the FOX NOW app, FOX viewers can watch full episodes of their favorite FOX shows on a variety of digital platforms, while enjoying enhanced interactive and social capabilities around those shows. Download the FOX NOW app at www.fox.com/foxnow. To watch primetime programming live on the web, visit www.fox.com/live. “Like” FOX on Facebook at www.facebook.com/FOXTV and follow the network on Twitter @FOXTV. For additional information about FOX, please visit www.fox.com. ITV America, ITV’s US group of businesses, is the largest independent producer of non-scripted content in the US, producing more than 100 programs, totaling over 800 hours of content, in partnership with more than 40 networks. Hit series include Fixer Upper (HGTV); Hell’s Kitchen, The Four: Battle for Stardom and American Grit with John Cena (FOX); Killing Fields (Discovery); The First 48 (A&E); Tiny House Nation (FYI); The Real Housewives of New Jersey (Bravo); Duck Dynasty (A&E); Pawn Stars, Alone and Forged in Fire (History); Cake Boss (TLC); Marriage Boot Camp (WE tv); and the new Queer Eye (Netflix). Companies under the ITV America banner include ITV Entertainment, Leftfield Pictures, Loud TV, Outpost Entertainment, Sirens Media, Gurney Productions, High Noon Entertainment and Thinkfactory Media, as well as numerous talent-driven production partnerships. Development and production is currently underway across numerous broadcast and cable networks, and platforms including Netflix, Amazon, Facebook, YouTube and others.